During our time here is Spain we have visited a great number of churches and cathedrals. Each one similar in many aspects, but unique and special in their own way. Many side Chapels dedicated to different patron saints, many chapels have been closed off by iron railing to prevent people from entering. 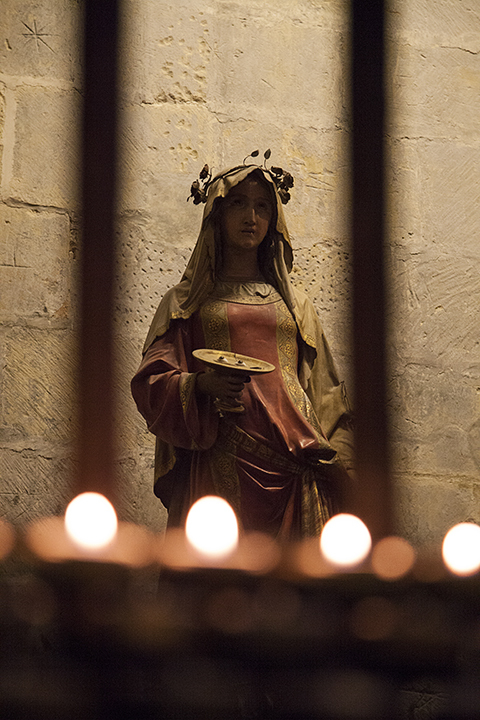 Just outside the chapel a tray of candles and at times some of the candles might be lit. 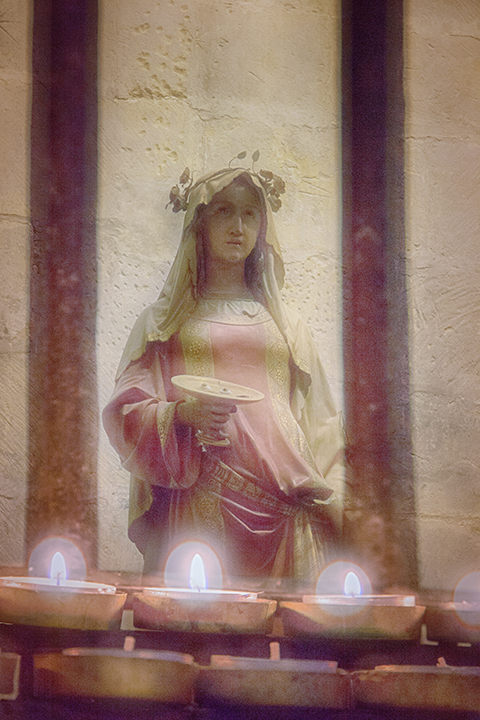 Lighting a candle is a way of extending one’s prayer and showing solidarity with the person on whose behalf the prayer is offered or it may be an offering lit by someone seeking a favour from the saint before whom it has been placed. 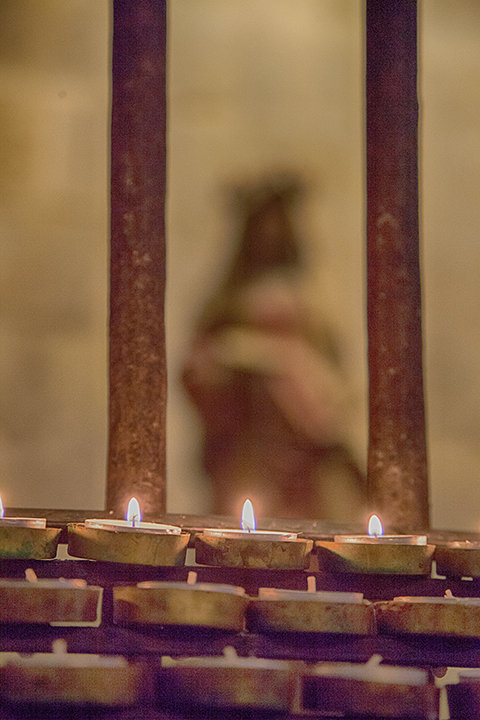 As a photographer I have often found it difficult to get an image showing both the candle and flame, as well as the saint’s statue in focus. 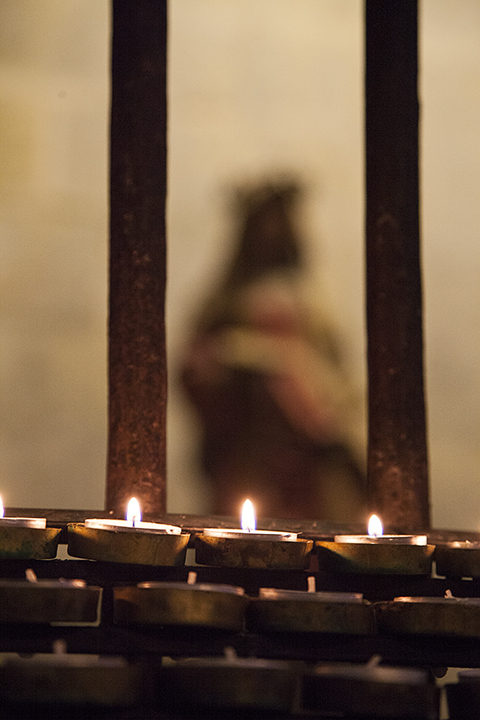 Many of the churches and cathedrals are rather dark, and do not allow tripods, or I have failed carry mine that day! 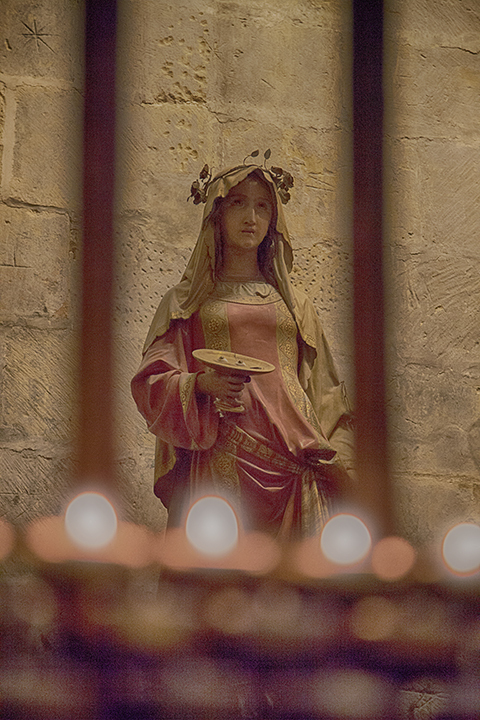 The ISO is set as high as the camera will allow and then the lens is opened to the widest aperture allowing for a narrow depth of field, resulting in either the candles or the statue to be in focus. This time I took two images, processed them both with Nik Software HDR Effects Pro, then layered them together in Photoshop, anyone remember the Orton slide sandwich effect this image reminds me of that effect. I am looking for some feedback, besides the obvious; carry a tripod! As an update I thought that I would include with the post the original image and the first edit that made up the final image. I took each of the original images into Nik HDR single image, then merge the two in Photoshop. Well done! I do remember the Orton effect. I never used it myself, but I loved the results my colleagues achieved when they applied it with slides. This looks like an ingenious way to solve the problem you described with candles in a church setting. As for feedback, it would be interesting to see the separate images before the “sandwich” along with the final result. One other question, this scene implies a brightly lit sanctuary; have you tried this in a dimly lit scene? At any rate, I do like this effect that you have achieved. It imparts an ethereal quality that is perfect for the subject matter. HI Robin, glad you like it. the chapel is quite dim, I processed both images with Nik HDR single image processing that lightened them up considerably and brought out some of the detail. I had thought about including the original images in the post, maybe I will do that and reblog, thanks for the suggestion. I will let you know if I get a chance…. OK, that would be interesting if you have time. I recall that the Orton effect would have one image sharp, the second out of focus. In Photoshop, one could create the out of focus layer using the Gaussian blur tool. Is that your approach? At any rate, every application of the Orton technique that I’ve seen has been with flowers and/or a landscape. 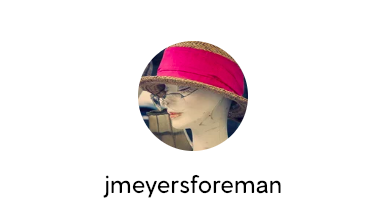 I like that you went in a different direction. I will work on it, during our next train ride – off to Huelva the Cordoba! let me know if you have any recommendations for sight seeing! OK, sounds good. I haven’t been to Huelva or Cordoba, so can’t speak from personal experience. However, I hear that the Donana National Park is supposed to be good. Sounds like you are seeing a good deal of Spain. Hi Robin, just a quick note, but I have added the two images that make up the final image to the blog, they are small but hopefully you can see what I started with!